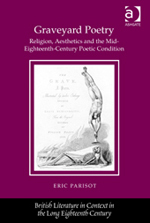 This book examines ‘Graveyard poetry’, a critical appellation described by its author, Eric Parisot (Australian Research Council Discovery Early Career Research Award Fellow, University of Queensland) as an imperfect, but serviceable and (grudgingly) accepted construct, commonly used to discuss the work of a group of eighteenth-century British poets meditating on death and Christian salvation, and doing so in close proximity of the dead, usually in a crypt or at a graveyard. If this cruelly crude summary sounds like it describes a simple enough phenomenon, think again: Parisot’s book shows clearly that everything about this category – the names of the artists who should be included in it, including Robert Blair, Edward Young, Thomas Grey, John Ogilvie, John Cunningham, Thomas Wharton (to name but a few), different characteristics of their work, the different sentiments addressed or evoked, and the effects the works had on contemporary readers (as well as readers in our own time) – can be questioned, contested or denied. And it often is. In his introduction, the author asks a number of pertinent questions about the school of Graveyard poets and, indirectly, about the purpose and scope of his book. The first such question is what makes this poetry different from its Renaissance precursors, such as Milton’s Il Penseroso Shakespeare’s gravedigger scene in Hamlet and other literary descendants of the ars moriendi, mode (teaching on the excellent way to die, a major medieval mode of writing. Note: one the earliest and most seminal examples of the mode, Boethius’ Consolations of Philosophy, does not get a mention here (possibly because it is early on in the book, and because descendants often attract more attention than forebears, except when one is not a medievalist or a classicist). The second important question is what poetic criteria can be used to include or exclude particular eighteenth century poets from the group. The third question asks why more critics have not approached the graveyard poets from a historicist perspective (the perspective which pays closer attention to the critical and public reception of the works in their own time). Why indeed? I thought that Parisot’s decision to Graveyard poetry by gauging its commerce with contemporary writers and readers – was particularly fortuitous. The author scrupulously avoids making claims to originality, and, indeed, shows how and why this has been done before, but this saddened me, as there was clearly enough originality of approach to carry the subsequent substantial discussion based on it. That said, I keenly felt the need for a stronger authorial voice to tell me in the introduction what overarching and what smaller arguments will be made in the book. This would have made the vast pool of knowledge that is this book a user-friendlier place. Being modest is laudable, of course, and never more so when the author is erudite and knowledgeable. But taking a strong stance is not always such a bad thing either: not all readers are experts in the matter at hand, curious though they might be; and an attempt at clear-voiced delineation of one’s contribution to the field makes things easier on readers coming from another area of expertise, often with a genuine desire to learn. To them, a clear statement of intent is a strong tune which gives sense to the complex supporting polyphonic harmonies of the author’s analyses. The philosophical views, values and aspirations that eighteenth-century poets held dear and used to underpin their work, as well as what the eighteenth-century readers thought about Graveyard poetry, how they engaged with it, what emotional needs it met and to what intellectual use it was put, are crucial questions needing clear answers. Parisot’s book represents a brave and thoroughly researched attempt to answer them. The book is divided into five chapters. The first, ‘Prospects of Eternity: The Theology of Poetic Salvation’ examines the influence of religious debates on Graveyard poetry and its primary concern with the religious and spiritual health of the individual. It also touches on the work of the poets aimed at representing poetic inspiration as divinely originated, something which also passionately preoccupied many earlier generations of poets.The second chapter, ‘The Problem of Religious Authority and Poetic Autonomy’ examines the poets’ attempts to legitimise the poetic endeavor by reminding the reader of its association with ancient religious texts. Graveyard poets, Parisot argues, go beyond simply lending poetry prestige by turning it into a third, philosophical tine of societal power, alongside the new office of the first British prime Minister (secular), and the power of religious office on the other (spiritual). This entry was posted in BOOK REVIEWS and tagged Danijela Kambaskovic-Sawers, Eric Parisot. Bookmark the permalink.